Eming et al. Wound repair and regeneration: mechanisms, signaling, and translation. Sci Transl Med. 2014 Dec 3;6(265):265sr6. The cellular and molecular mechanisms underpinning tissue repair and its failure to heal are still poorly understood, and current therapies are limited. 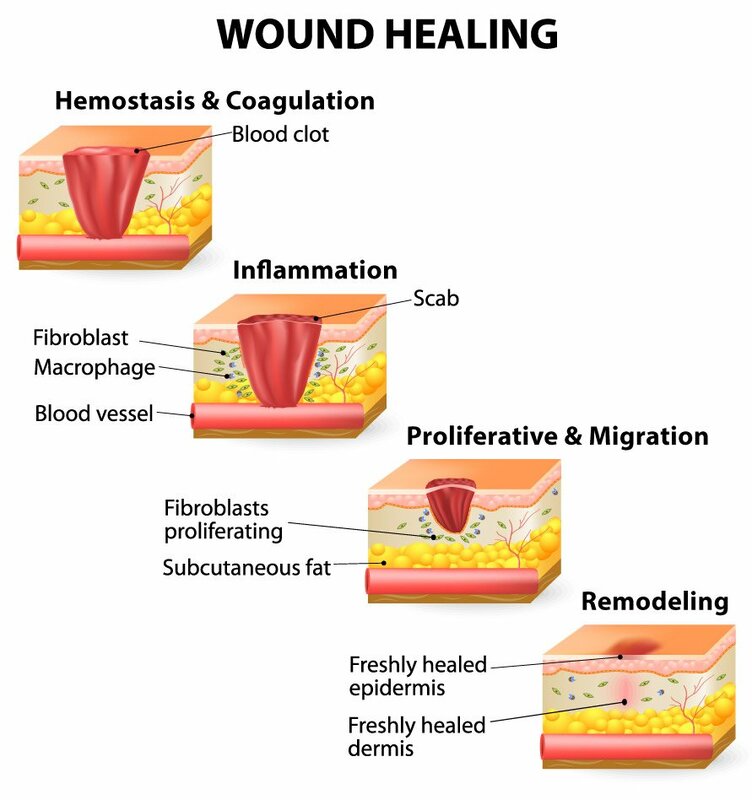 Poor wound healing after trauma, surgery, acute illness, or chronic disease conditions affects millions of people worldwide each year and is the consequence of poorly regulated elements of the healthy tissue repair response, including inflammation, angiogenesis, matrix deposition, and cell recruitment. Failure of one or several of these cellular processes is generally linked to an underlying clinical condition, such as vascular disease, diabetes, or aging, which are all frequently associated with healing pathologies. The search for clinical strategies that might improve the body’s natural repair mechanisms will need to be based on a thorough understanding of the basic biology of repair and regeneration. In this review, we highlight emerging concepts in tissue regeneration and repair, and provide some perspectives on how to translate current knowledge into viable clinical approaches for treating patients with wound-healing pathologies. I'm on DMF and I can't seem to get rid of a wart on my hand. I've had it frozen twice, tried tape over it and also home treatment gel, which stings after application. On my foot it seems there are three possible warts emerging. Small world! Had 11th freezing on Friday, finally blistered. Do not wait for them to get established on your foot, treat quickly. Is this a thing? I have also just rid of my second verruca whilst on Tecfidera. What was your treatment Jims for the verucca? How very odd, I have just found a verruca last night as well and was wondering if it could be DMF related as such a strange thing to get at my age. Not had one since I was 10 years old which is a very, very long time ago. What other infections could DMF & low lymphocytes (0.7) leave you open to? May be there is something in the relationship of DMF and warts. I'm reading about papovaviruses. Human papillomaviruses, there are at least 70 types, responsible for the common wart. In the same paragraph it goes on to say a related virus the JCV that causes PML.